The Bastide awaits you. 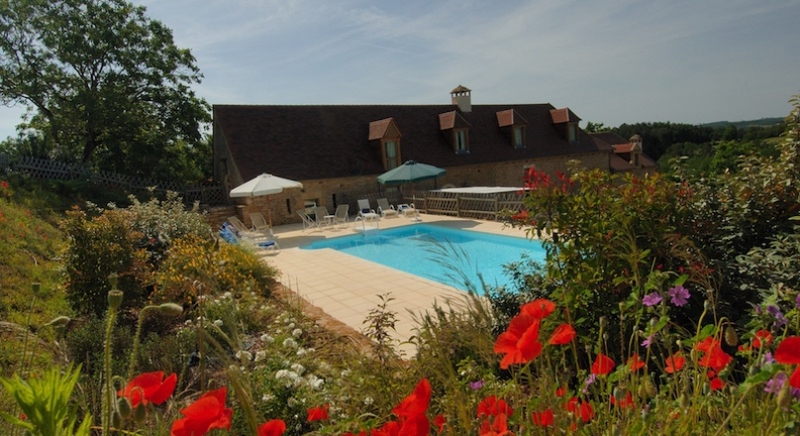 It is an old farm of the XVIIIth century and is located on an estate of 35ha, near Lascaux and Sarlat. This typical Perigord house has an area of 280 m2 and you will be enchanted by the charm of its old stone walls. There is a private heated secure swimming pool (5 m x 10 m) close to the house with sun loungers and parasols. There is also a terrace with a table and chairs under the shade of an awning and a barbecue is provided. The fully equipped kitchen is open plans with the dining room which has an old feature fireplace. There is a large living-room (50 m2) where you will find leather sofas and another fireplace. an adjacent TV area and play area with satellite TV, a DVD player and Hi-Fi system. On the ground floor are two completely independent air-conditioned bedrooms (each with 2 electric 80x200 cm beds) and each equipped with a private bathroom or shower plus two separate toilets. Upstairs are four large air-conditioned bedrooms ( two with Queen size beds, and two with two 80x200 cm electric beds) and three private shower-rooms with toilets. A small living-room completes the first floor. In our rates are included: sheets, towels for the bathrooms and towels for the swimming pool, visitor's tax, VAT, end of stay cleaning, daily maintenance of your swimming pool, swimming pool heating (from June to September), energies.